﻿﻿﻿﻿Historic 1921 flood brought subsequent butterfly deluge. Nov. 1, 1921. A mother looks to the South Texas sky, marveling at a cloud of ashes hurtling toward her, fluttering, falling, blotting out the sun. She peers more closely and realizes they are butterflies, las mariposas, and la madre falls to her knees and makes the sign of the cross as the insects fill the air around her. She knows this day is Día de los Angelitas, the part of the Día de los Muertos celebration set aside to honor dead children. She believes the children have returned on wings. This particular butterfly story sprouts from seeds planted weeks earlier in tragedy. Central Texas languished in a bone-dry drought, and people begged the heavens for rain. Their answer came when remnants of a Category 1 hurricane left Mexico and moved north across Texas, where it rammed into a high-pressure system, lingered over an area from San Antonio to Temple, and roared. The onslaught of lightning and thunder terrified residents cowering in their homes. The storm crashed atop the area by 7 p.m. All during its rampage there was a continuous roar, caused by thunder, falling rain and gusts of wind. Neither thunder nor lightning ceased the entire night. In Taylor, 10.5 inches of rain fell in three hours before slowing down and allowing residents to hope for an end to the deluge. Instead, at 3 a.m. a second wave arrived. Rain covered much of South and Central Texas, including along the Colorado River, which rose by 18.2 feet in Austin, leading to widespread damage as creeks overflowed and tore apart roads. Telephone and telegraph lines were down throughout the area, a 15- to 20-mile stretch of railroad was washed away, and bridges were destroyed. In Friendship, Rozacky tried to herd pigs and sheep to higher ground. Five miles north of Taylor, the town of Thrall officially got the worst of it, with 38.2 inches of rain falling in just 24 hours, for decades cited as a record for the continental United States. Entire families drowned in the unexpected onslaught, including a clan camped on the banks of Brushy Creek. The San Gabriel River ran three miles wide, and the Little River near Temple was five miles across. The San Gabriel saw three surges of water, the first a four-foot wall of water that had the river rising two feet per minute until it jumped its banks, Owens said. Eighteen houses were seen floating past the Circleville community. Owens quoted a death toll of 159 people. The storm was also something of an omen for Friendship. 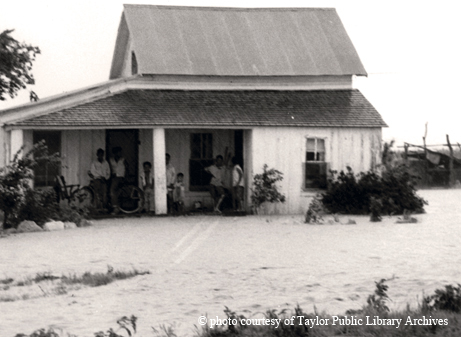 The community, which dated back to 1847, was mostly destroyed by the storm and rebuilt on higher ground, but in 1980 a dam was constructed, and the waters of what is now Granger Lake covered Friendship. As the waters receded in 1921, men on horseback tried to rebuild bridges but sank into the mud up to their saddles. Many pigs had gone feral and had to be shot. Central Texas slowly dried out, and two weeks later something seemingly magical happened: Butterflies. Lots and lots of butterflies. First spotted near San Marcos, they filled the skies and covered everything in their path. Estimates are 25 million a minute flew for 18 days toward Mexico, as many as 6 billion total. 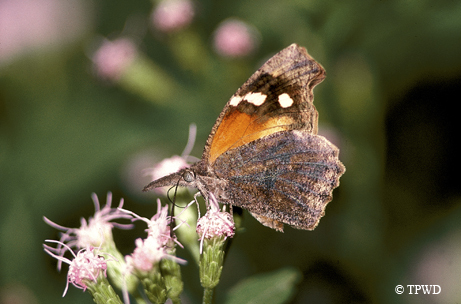 The species that invaded the area was the American snout butterfly. The belief is that snout butterflies react to extreme drought conditions followed by extreme rain by quickly multiplying. The reasons are many: The parasites that usually keep the butterflies in check are scaled back by the drought, and the snouts push the reproductive pause button in dry times but kick into action when it rains. Just as important, the wet weather brings to life the drought-resistant spiny hackberry, a common South Texas shrub that serves as a main host/food source for the snouts. With its wings closed tight, the snout presents a drab gray color, giving it the appearance of a dead leaf. Once open-winged, a brilliant flash of orange, black and white is revealed. All the prettier for mating. And the snout invasion was all about mating. Think of it like cool high school senior boys who date wide-eyed freshman girls. The freshman boys then have to look elsewhere for dates. So the sky was full of young male snouts seeking new mates while the freshly emerged females mated with the older butterflies. Snouts can go from egg to adult butterfly in 16 days, so the explosion in numbers makes sense. There was a certain poetry in the timing of the butterfly, seen since Roman times as a symbol for the souls of the dead, arriving on the Day of the Dead, a two-day celebration that stems from an Aztec festival originally dedicated to the goddess Mictecacihuatl. On Nov. 1, children construct an altar to welcome the angelitos, the souls of lost children, back for a visit. The altars are filled with cookies, milk and toys for the lost children. The adult souls arrive one day later. The lost children were said to live in the fourth of 13 Aztec heavens, a place filled with lush greenery where it is forever springtime. This heaven, called Tlalocan and ruled by Tlaloc, a water god, was the final home for people who died in water (as well as newborns and mothers who died in childbirth). During the spring, Aztec rain-making ceremonies gruesomely involved the sacrifice of newborns because their tears were considered pure. A century ago, a mighty storm brought the souls of children on the wings of billions of snout butterflies to incredulous South Texas residents. Even today, every few years or so, the conditions are right for another snout invasion, incredible clouds of winged souls.